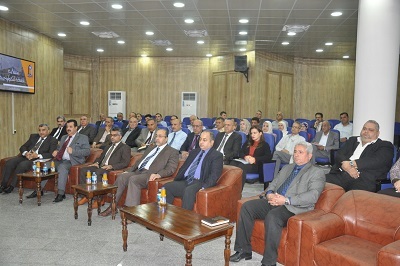 The President of the University of Technology, Prof. Dr. Amin Douai Thamer, met on Sunday 19/11/2017 the heads of the engineering and scientific departments and their assistants and some of the advanced staff at the conference hall of the Department of Construction and building Engineering. Prof.Dr. Amin Douai Thamer gave a speech in which he discussed the mechanisms of the University's independence project since the beginning of its first steps and what are the powers granted to the university. 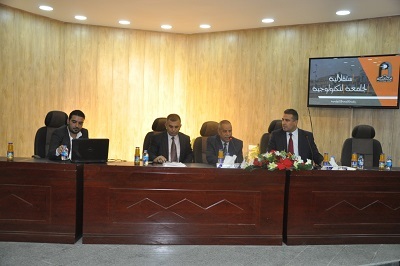 Dr. Alaa Abd Al-Hassan Attiyah, The Deputy for Scientific Affairs at the university of technology , spoke about the work of the committees that were formed within the project of the independence of the university and the powers granted to the University of Technology other than the other universities. Research and development, as well as the work of the Department of Studies, Planning and Follow-up and the Department of Missions and Cultural Relations.